I had to watch this twice! The daily grind… it can get to any of us. Those long commutes can take their t.o.l.l. Let’s take a look at the ruff day Eclipse has to deal with. 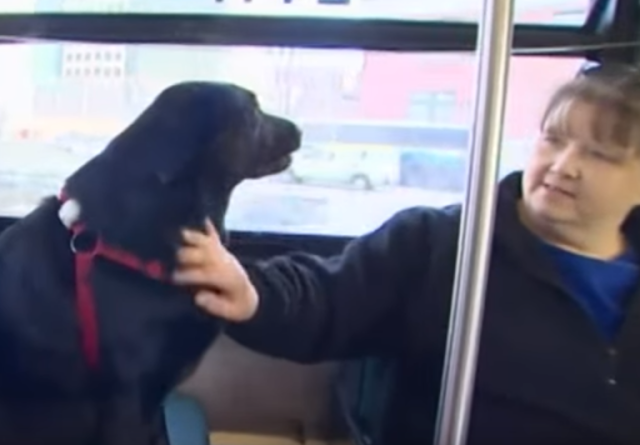 The adorable dog takes the bus all by herself to her destination: the dog park! You HAVE to see this amazing video, which shows Eclipse mingling with her fellow passengers, slobbering on a few of them at times, and generally hanging out like a perfectly normal commuter. We can only imagine how the humans felt the first time they saw Eclipse trotting onto the bus by herself, looking for an open seat, hopping on and making herself comfortable (she likes the window seat because she can look outside and admire the scenery; it probably also helps her know when her stop’s coming up). Of course, Eclipse hasn’t always been this independent and self-sufficient. She and her owner, Jeff Young, had been going to the park for ages together. Then, one day the 2-year-old lab jumped on the bus while Jeff was distracted, and the bus took off without him. He followed behind on the next bus, and sure enough, his smart dog got off at the right stop. Jeff didn’t seem all that worried that his best friend was commuting by herself to the park. “She’s a people person,” he says, who loves to interact with the other passengers. Judging from how happy they look in this video, they don’t mind it either! A local DJ even snapped a selfie with the pooch because he couldn’t believe what he was seeing! Next time you have a ruff day, hopefully there will be an adorable black lab sitting next to you to give you something to smile about. The only question we’re wondering about is whether Eclipse needs to p.a.y the fare when she rides the bus!